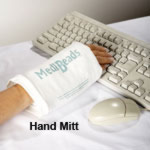 These Protocold cold packs provide relief from muscle sprains and strains, joint pain, arthritis, post-surgical pain, sinus headaches, burns and sunburns. Safe and easy to use, these pads are condensation-free and will remain dry during treatment. These soft, flexible pads may be applied directly to the site of pain to provide timed-released cold recommended by doctors. Cold pads will not split, bunch or bottom out. Just place in freezer for two hours and apply to affected area for up to 30 minutes. Surface may be washed and disinfected. 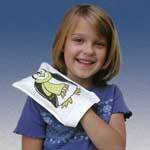 Non-toxic, latex free, non-gel matrix pad. Adjustable wrap to secure pad included. Standard Size (12 in x 16 in) - Use for back, hip and shoulder pain. Half Size (8 1/2 in x 12 in) - For pain in shoulder, back and legs. 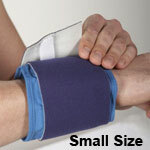 Small Size (4 1/2 in x 12 in) - Designed for use on knee, foot, ankle and wrist. 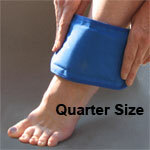 Quarter Size (4 in x 8 in) - Use on elbow, wrist and ankle.